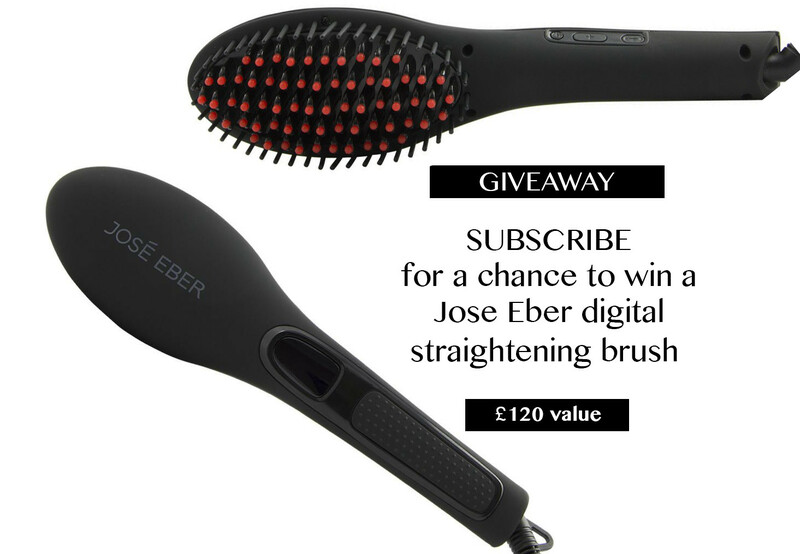 Be one of the first people to get your hands on Jose Eber‘s latest innovative product, the digital straightening brush! I received this exciting product a few days ago and I am already obsessed! It makes getting ready in the mornings so much easier and quicker. I have naturally straight hair, but after blowdrying I have to apply extra heat in order to smooth my hair and tame the fly aways. Usually, I use my Jose Eber curling wand each morning or the vibrating flat iron but now I have an even quicker option for those mornings when I’m rushing out the door! The digital straightening brush has anti-static ceramic bristles which heat up to whatever temperature you set it to. Simply brush through your hair slowly, leaving it smooth, sleek and shiny! Each heated bristle has a silicone tip which guards your scalp and helps the brush glide effortless through your hair. Straightening time is halved and you’re ready to roll within minutes! I’ll be running a new giveaway each month exclusive to my email subscribers. All you need to do is sign up once and you’ll be automatically included in each monthly draw. Thank you to Jose Eber for supporting this giveaway! Don’t forget to check out all their amazing products over on their website here, and remember you can get 20% off everything using code SHEGOESWEAR. Join the She Goes Wear newsletter for exclusive content, giveaways and more!